Home /Congress, Demography, Election Commissioner, Elections, Grand Alliance, India, Indian State elections, IndiaVotes2019, Nationalism, Political Parties, Propaganda, Religion, Security, Social Media, Technology/The 2019 Indian General Elections: The consolidation of BJP dominance? The race has started, as on 11 April 2019 approximately 900 million Indian voters were called to cast their vote in the world’s largest general election: India’s seventeenth since 1952. Until a year ago, most pundits were predicting an easy win for the Bharatiya Janata Party (BJP) and its allies of the National Democratic Alliance (NDA). Despite a few setbacks, the BJP had been on an almost uninterrupted winning streak in state assembly elections (Vidhan Sabha) since regaining control of the national parliament (Lok Sabha) in 2014. 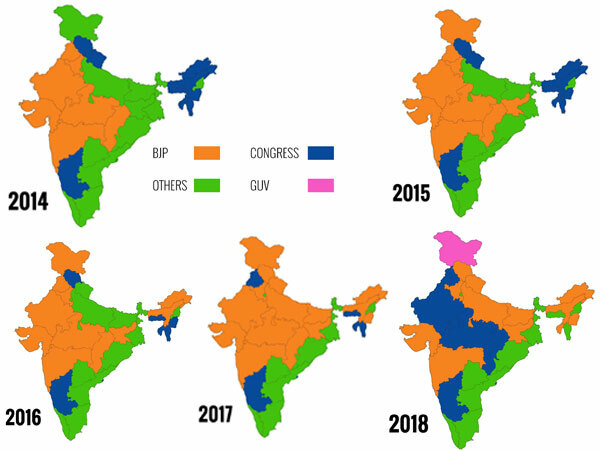 Indeed, by the summer of 2018, most of India’s political map was coloured saffron. The BJP governed either on its own or in coalition with regional allies in 21 states. In contrast, Congress was left with the Punjab, Mizoram (which it has since lost) and Karnataka (where it governs in coalition with the Janata Dal (Secular) party). However, the electoral dominance of the BJP was perhaps never as impressive as it seemed. The 2014 elections were won primarily in the Hindi heartland and the west of India, the traditional strongholds of the party. Here, the BJP amassed more than 50 per cent of the vote and captured nearly all of the seats. The party’s presence remained much weaker in the east and south of India (except for Karnataka) and the (scarcely populated) states of Northeast India. State assembly elections since 2014 have given the BJP a stronger presence in the latter region, although here the BJP relies on the support of (often stronger) regional allies. Most recently, the BJP lost power to the Congress party in the three Hindi heartland states of Madhya Pradesh, Rajasthan and Chhattisgarh during state assembly elections there in November/December 2018 (albeit with a significant difference in vote share only in Chhattisgarh). These losses materialised against a backdrop of lower than expected economic growth (some of it in the aftermath of demonetisation and the GST reform) and low levels of job creation as well as rising agrarian distress. Furthermore, anti-incumbency sentiment against the party in these BJP-ruled state governments also played a role. By the end of January 2019, even BJP leader Narendra Modi’s popularity was somewhat in decline. In January 2017 the Mood of the Nation poll tracker showed a gap of 55 per cent between Modi’s popularity (‘best suited to be Prime Minister’) and that of the Congress leader Rahul Gandhi (65 versus 10 per cent, respectively). By January 2019, this gap had narrowed to just 12 per cent (46 per cent as against 34). This change makes the 2019 elections a much more open race, in which a resurgent Congress and the resilience of the regional parties could deprive not just the BJP but indeed the National Democratic Alliance (NDA) of a parliamentary majority. However, as Indians now head to the polls, the momentum has tilted somewhat back in the direction of the BJP and its allies. This is partly a reflection of the party’s electoral and campaign strategy. The BJP’s confidence or ‘arrogance’ post-2014 alienated many of its erstwhile partners with which it was aligned through seat-sharing arrangements or post-election coalition deals. However, the losses in the November/December 2018 assembly elections strengthened the resolve of the BJP to nurture such alliances in its pursuit of power, and rather generous seat-sharing arrangements have brought estranged allies such as the Shiv Sena (in Maharashtra) and the Asom Gana Parishad (in Assam) back into the BJP/NDA fold. The Pulwama terrorist attack in February 2019 (and the ensuing military response in Balakot) enabled Modi and the BJP to portray themselves as India’s chowkidars (watchmen), the alleged ‘true defenders of India’s national security and territorial integrity’. The narrative has shifted from development in 2014 to national security or nationalism more broadly, an issue which the BJP seeks to ‘own’. This strategy may have worked to some extent. A recent poll by Lokniti – a research programme of the Centre for the Study of Developing Societies (CSDS) – suggests that Balakot (along with recently announced schemes to alleviate farmers’ distress and 10 per cent reservations for the economically weaker) has restored the lead of the BJP and strengthened Modi’s popularity. Even without it, the BJP would have a head start against any of the other parties due to its electoral machine and ability to influence the narrative. It has strongly developed ties with corporate organisations and the media, can turn to the Rashtriya Swayamsevak Sangh (RSS), its volunteer organisation, to mobilise the vote, and has access to unprecedented campaign finance. The party appears to have amassed 95 per cent of the revenue from electoral bonds introduced in 2017. Congress, on the other hand, needs to weigh the benefits of forming alliances in terms of generating short-term electoral gain against the long-term aspiration of renewing its organisation in the states where it is weak. Although the party has forged important seat-sharing alliances with other parties in states such as Bihar, Maharashtra, Karnataka, Jharkhand and Tamil Nadu, it did not do so in Delhi, West Bengal, Odisha or – crucially – Uttar Pradesh (UP), which alone sends 80 representatives to the Lok Sabha. Fielding Priyanka Gandhi in UP could result in taking more support from the alliance between the Bahujan Samaj Party (BSP) and the Samajwadi Party (SP) than from the BJP. Furthermore, as Rahul Verma and Pranav Gupta have shown, Congress needs a massive swing in its favour if it is to recapture most of the seats in which it came second in the 2014 elections. In 124 of those 228 seats, the gap with its nearest rival (the BJP in the Hindi heartland) was 15 per cent or more. It remains to be seen whether Congress’ manifesto, which proposes the introduction of a universal basic income scheme, will be a game changer. However, the CSDS/-Lokniti poll shows that unemployment, development and price rises vastly outweigh national security as the most important voting issue. Also, as in the November/December 2018 state assembly elections, anti-incumbency votes directed against the BJP may help Congress. General elections in India are notoriously difficult to predict. 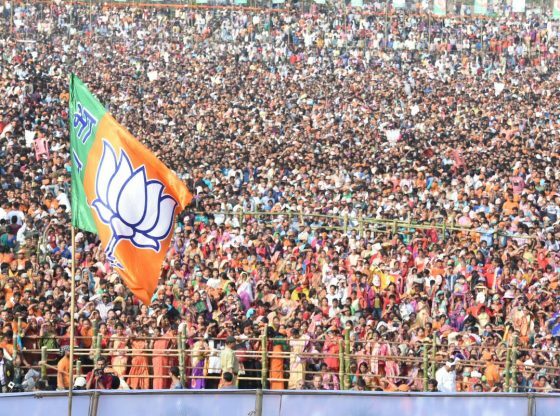 The BJP is expected to come down somewhat from its high seat share in the Hindi heartland and the west of India, and its progress in the northeast and east is unlikely to offset these losses. For the BJP to regain power, therefore, it will likely have to offer various cabinet positions to its partners in the NDA. Meanwhile, although Congress is likely to do better than its dismal result in 2014, hardly any polls over the last few months have put the centre-left United Progressive Alliance (UPA) led by Congress in first place. Collectively, regional parties are likely to do as well, if not better than in 2014, and they could play a crucial role should the elections return a hung parliament. Whatever the outcome, these are important elections. They will determine the extent to which the BJP can translate dominance into hegemony and challenge India’s commitment to liberal democracy and secularism. In regard to electoral trends worldwide, the 2019 Indian general elections provide an important test case of what matters most: economic concerns (which should lead to the BJP losing votes and seats) or nationalism and identity politics (which could strengthen the BJP). Usually, the former outweighs the latter, but in a context of rising nationalist populism around the globe and in India, that may no longer be the case. We will know the answer on 23 May 2019. *Schakel, Arjan, Chanchal Kumar Sharma and Wilfried Swenden, ‘India after the 2014 General Elections: BJP dominance and the crisis of the third party system’ (unpublished manuscript). **Articles published by The Asia Dialogue represent the views of the author(s) and not necessarily those of The Asia Dialogue or affiliated institutions.